Baile An Salsa, an international mix of world-class musicians, seamlessly blends Latin rhythms and traditional Irish Music – a fusion they call “Salsa-Trad.” We are so excited to welcome them back to the Irish Center – last year’s concert was quite the party – and this year we’re upping the fun level with pre-concert Salsa lessons!! Lessons are totally optional, but whether you want to dance or just enjoy the music, you don’t want to miss Baile An Salsa! 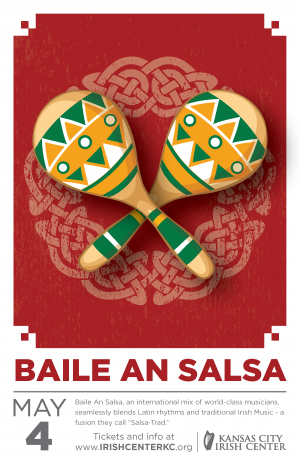 Kick-off the night with a 45-minute salsa lesson with local instructor Bird Fleming, and then have fun using your new-found salsa skills at the Baile An Salsa Concert! There are only 50 of these spots total. Doors open at 6:30 p.m. for VIP ticket holders. $25 General Admission ($30 at door) Doors open at 7:30 p.m. for GA ticket holders.